That scene reminds me so much of John’s family (they’re Lebanese, not Greek, but the two are sort of similar … you know, everyone’s a cousin and that sort of thing). 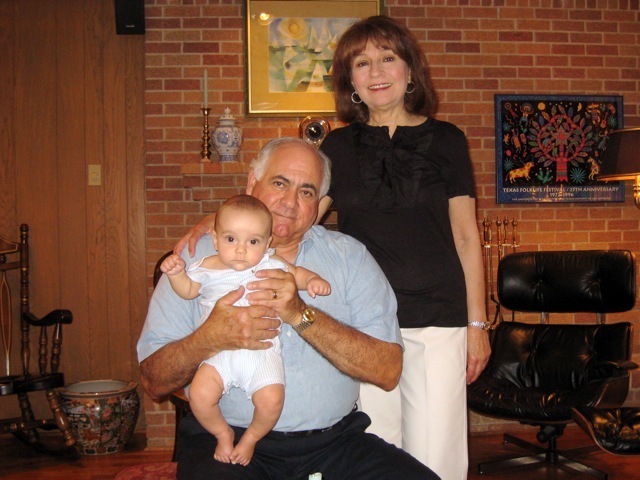 When we go to visit them in Dallas, there is always food, and lots of it. 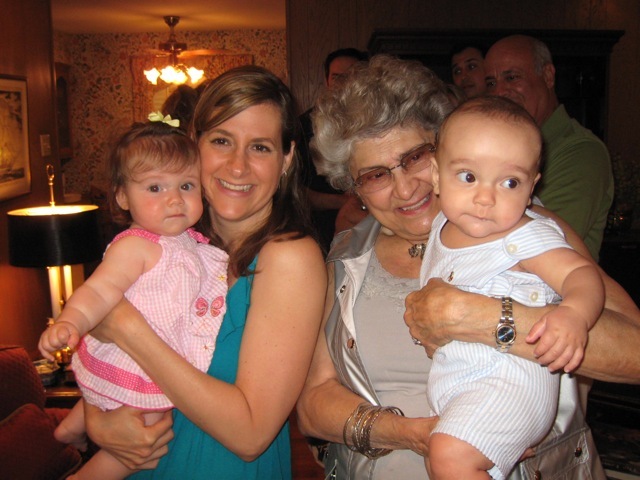 On special occasions, the women of the family get together at Aunt Mary’s house and put together an enormous spread, including dishes like hummus, fattoush, baked kibbeh, kibbeh nayyeh, lebni, and the infamous Saba-family rolled grape leaves (also known as stuffed grape leaves or “dolmas”). It is all completely authentic and delicious. 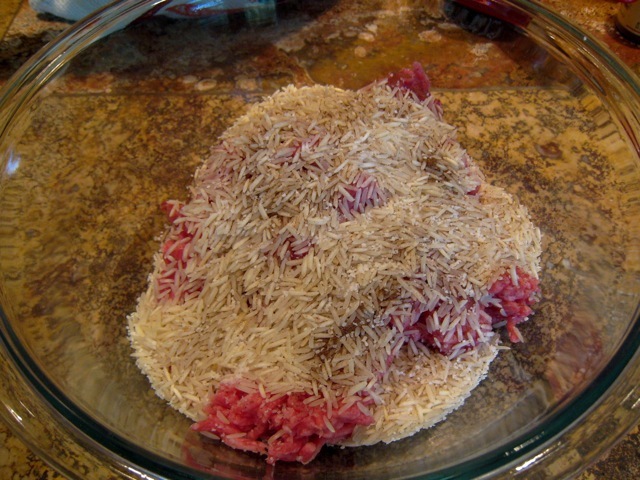 I use half ground beef and half ground lamb, rice, salt, pepper, and a little allspice. 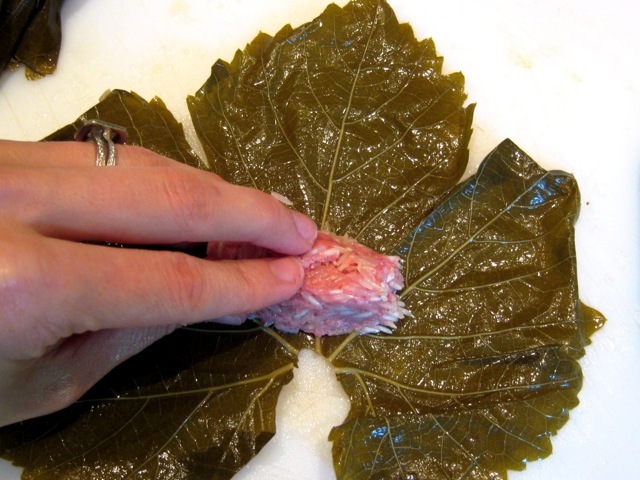 Pour a glass of wine before your start rolling the grape leaves. Put the rolled leaves in a pan, and cover with water. Put a lemon cut in half on top. Put the lid on and cook over medium heat. After a while, get John to taste them to see if they are ready! Uh-huh. I could see that it might take me more than one try to get it right. And it did. Finally, here is my recipe. Place the lamb in a medium-sized bowl. Add the rice. Squeeze the juice of ½ lemon into the bowl. Add olive oil, allspice, and salt to the bowl. Mix everything together with your hands. Separate about 5 to 10 leaves from the bunch, being careful not to tear the leaves. Fold the leaves in half so that all of the stems are protruding from one end. Using kitchen shears, snip off the stem (it’s edible, but tough). Place the cut leaves on the edge of the cutting board or another plate. Take one leaf from the stack of cut leaves and spread it out flat on your cutting board. Place about 1 to 1 ½ tablespoon of the lamb filling in the center of the leaf, just above the area where the stem used to be. Shape the filling with your fingers so that it is in a rectangular shape about 2 inches long. Now start rolling. Fold the back edges of the leaf, forward, over the filling. Fold the left side of the leaf over the filling. 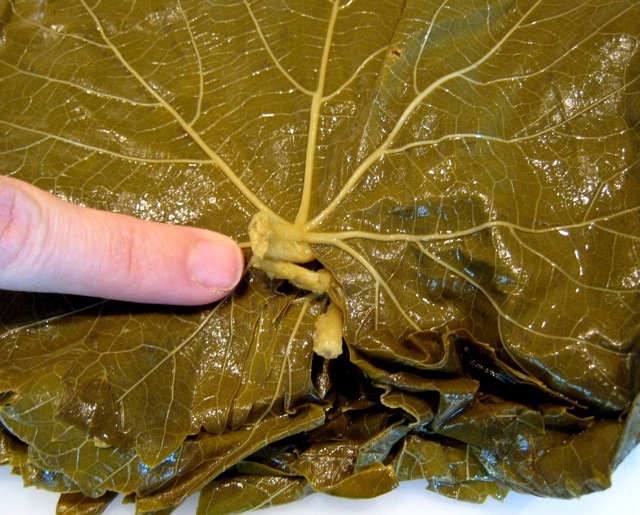 Then fold the right side of the leaf over the filling. Holding the folded edges of the leaves so that they fit snuggly over the filling, roll the leaf over the filling into a tight cylinder. 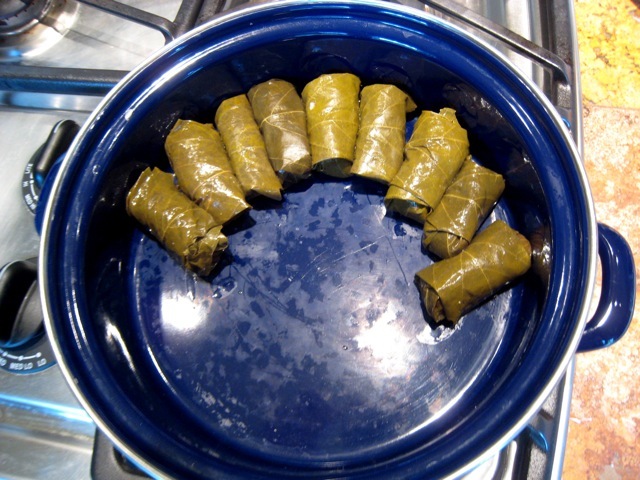 Continue rolling, and folding in the sides of the leaf as needed, until you have a complete roll. Rolling grape leaves can be a bit of a challenge, which is why Aunt Mary suggests pouring yourself a glass of wine at this point. 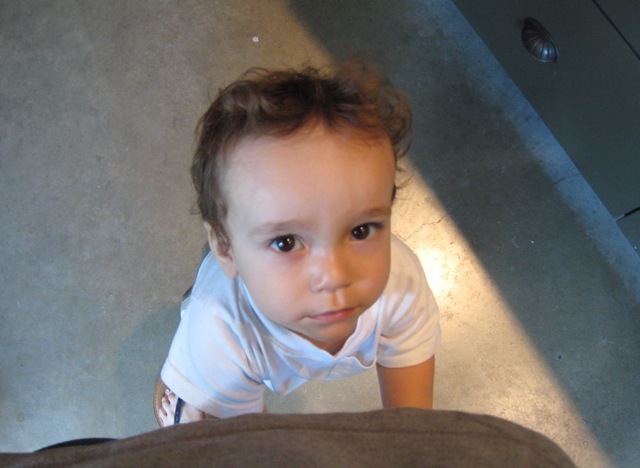 As a side note, if you happen to have a toddler tugging at your legs while you are attempting to do this, you may want to keep the bottle nearby. Place the roll, with the leaf-edge facing down, in a medium-sized shallow pot. 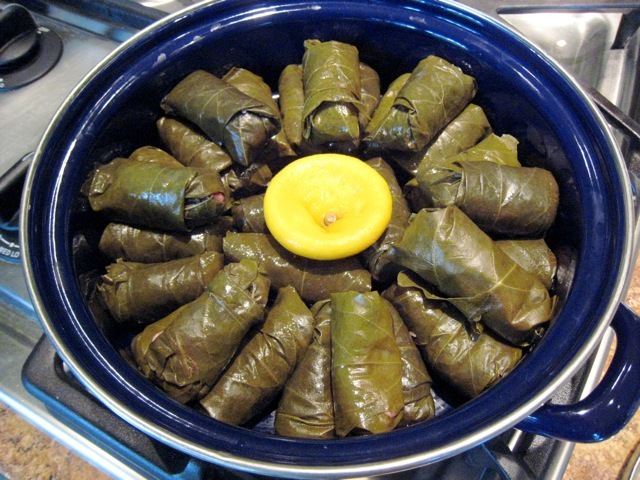 Repeat with remaining grape leaves until all the filling is used up, making a single layer of rolls in the bottom of the pot. If needed, make a second layer. 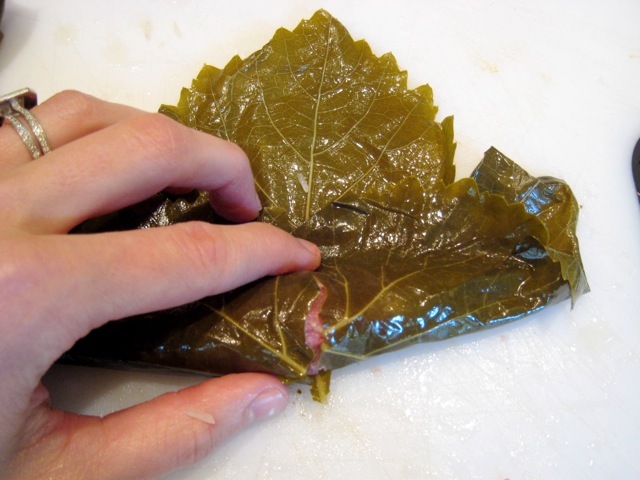 Squeeze the second ½ of your lemon over the rolled grape leaves. Place the rind in on top of the leaves. Find a lid that is too small to sit properly on the pot. 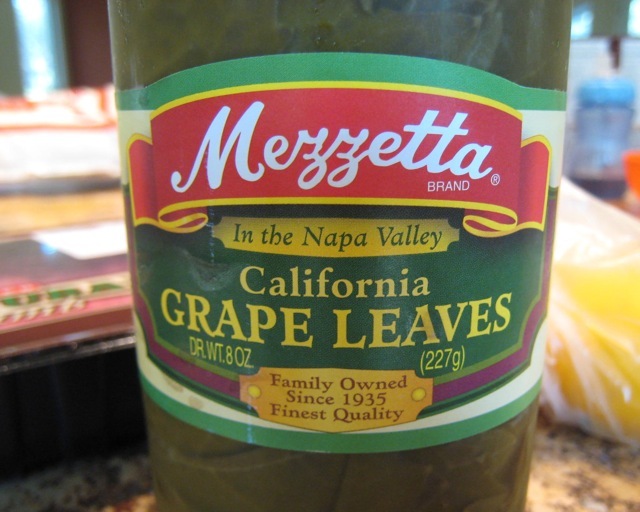 You want the lid to sit on the rolled grape leaves themselves; this will keep them leaves from unwrapping while they cook. With the lid pressing down on the rolled grape leaves, fill the pot with water. Cook over medium heat for about 1 hour. Cool at least 10 to 15 minutes before serving. 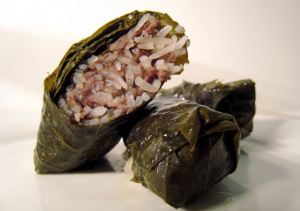 Rolled grape leaves may be served hot, warm, or room temperature. Hi Marie, your recipe except for the allspice, is very much like my grandmother’s, so I will try it. I’m having a devil of a time getting my grape leaves rolled up tight! Kudos to you for trying lebanese food, it all takes tons of time I think! Don’t know how grandma did it all the time like it was nothing! Love the wine idea too!! !